Kabhi Kabhie is really not that great of a film: lots of hypocrisy and unceasing moping, and if your DVD, like mine by Yash Raj Forever Classics (wishful thinking, YRF! ), has its colors set on extra high saturation and contrast, it's even quite garish to look at (more on that in a later post this week). 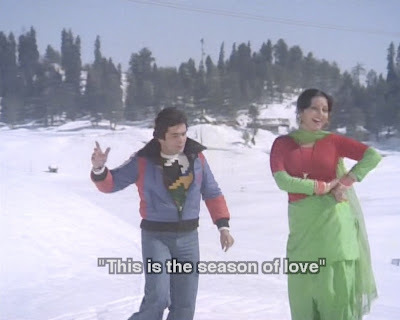 However, it's got some pretty people, and the Kashmiri romping guarantees at least the joys of winter fashions. The elder generation embraces sensible cold-weather clothing with taste and grace. With sherbet pastels and pinstripes, even! One lapse in taste: a poncho. And I know this post is about sweaters, not coats, but I cannot stop myself from pointing out how much this get-up reminds me of the collar-chewing disguise in the opening con of Shaan. Whenever you get Rishi and Kashmiri knitwear, you know something good is going to happen! In this case, a turtleneck with an extra layer on the front mimicking a vest! Neetu has a similar one later in yellow and green, though I think hers is an actual sweater vest over another sweater. 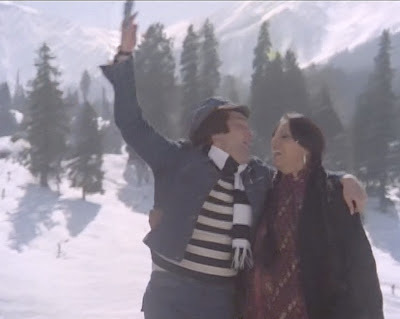 Aside: check out the name of Rakhee and Amitabh's lovey-dovey boat! After pulling these images, I thought I'd rifle through my other 70s screencaps to see what other fun I could find. Surprisingly, it turns out most of my insane sweater pictures are either earlier - like fun hillside romps starring Nanda and Shashi - or later - like the older Rishi we all know and love. But I did find a few more. 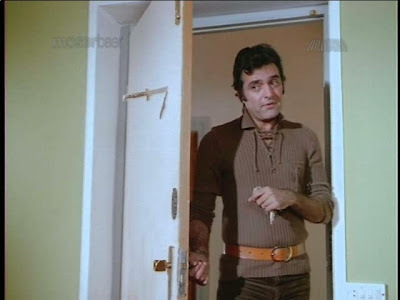 Here's one from Doosra Aadmi that makes me think perhaps Rishi's colorful houndstooth (above) was his personal sweater...or maybe these two movies were being filmed at the same time? He also gets a great stripey combo. In Apradh, Feroz and Mumtaz have a slew of matching lace-up knit tunics. This one is the chunkiest. 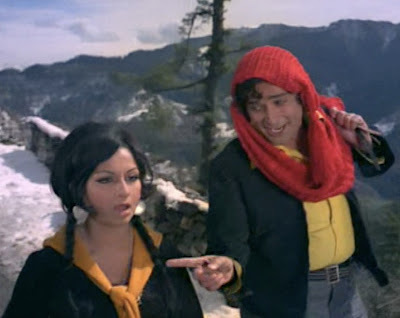 And who could forget Shashi's dopey tassled hat-scarf in Aa Gale Lag Jaa? If I had to guess, I'd say this is crocheted, not knitted, but it's too goofy a blob of ugly yarn to go by unnoted. Further proof of our masala twin-ism: I too remember Kabhi Kabhi as "that movie where everyone wore sweaters" (also, "Hot Rakhee & Neetu Sweater Action!"). The movie itself is, as you say, not the greatest. But it certainly had its own consistent style and mood that is hard to find even in Bollywood today. Ah ha! So he DID wear the same sweater in two movies! I kept thinking that when I saw it in DA that it looked really familiar! Vishal - Wonder twins activate! 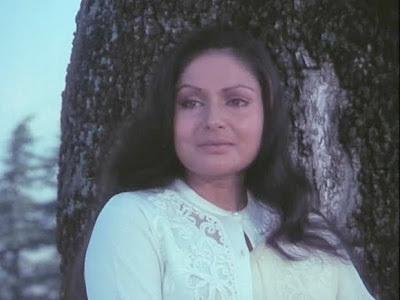 Re: sweater-licious ladies: if I recall, Neetu, being the sprightly younger character, is going to help you out in that regard a lot more than Rakhee. If you need a fix of Rakhee, I recommend Sharmilee (well, I recommend it anyway, for it is complex and pretty and amazing). Good call about the consistent look and what that does for the film overall. It is indeed a very contained movie in that way. 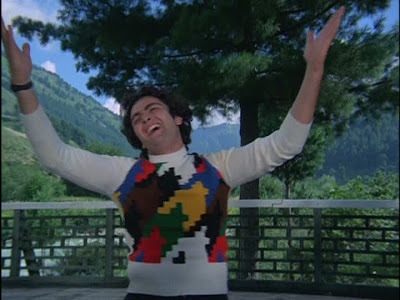 bollywooddeewana - I too think Rishi's pixellated sweater is pretty awesome. I actually said "Wow, how modern!" when I first saw it. Erin - He did!!! I can't wait to see what other duplicates I'll find throughout the week. 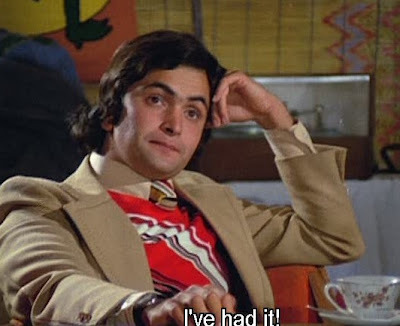 I know Shashi wears a tie of one pattern in this that he had in a shirt in Chori Mera Kaam, but I also just found ANOTHER tie of the same pattern but different colors in Chor Sipahee! When knitwear is here, 70s is in the air! I think Rishi for some reason has a body just made for furry things. He looks like he'd be very nice to pet. Too bad I'm allergic to wool or I'd be oohing and aahing too. 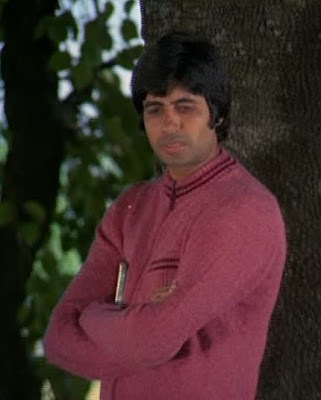 This is the only movie where Amitabh's parents did a cameo. Did you manage to spot them? It is so refreshing to see that the women of Kabhi Kabhi acutally wore sweaters, since through the 80s and 90s, the women tend to wear chiffons and shorts in snow, while the mena wear huge jackets. LOL Rishi was ingrained since his starting out to days to spread the message of jumper! But its very good to see the women of these movies while singing and frolicing in the snow got to wear a jumper unlike the trend of the 90's where the hero is all prepared to combat pneumonia on those Swiss mountains while the heroine is wearing the really thin sari! sorry lol that was my comment above! I forgot to sign out of my other account! But jumpers zindabad! Wonderful observations, Beth. 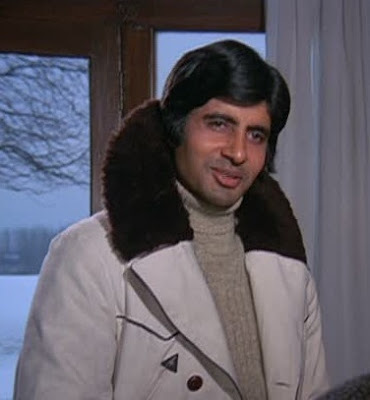 I remember Amitabh also had nice knits to wear on Silsila....remember "Yeh kahan aa gaye hum"? and "dekha ek khwab ke yeh silsiley huye"? and the look was complete with pastel coloured scarfs. Old world charm, eh? Now... people wear scarfs with vests (Hritik in Dhoom2) or with tight shirts (Aamir in Fanaa). Winter fashion is so predictable with blazers and jackets! If I didn't already, that film would have prompted me to take up knitting! Well done Beth! I also like the color difference your showed. WOW! 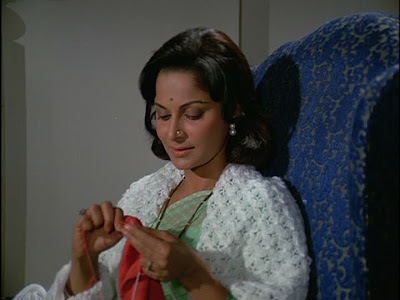 I remember the Rakhee knitting scene so well and I'm glad to see you've preserved it here. Some of these shots look good enough to grace the cover of a retro knitting pattern book, hai na?